Wow, today really is full of good news for iPad artists. I posted earlier on the big update to the excellent Procreate painting app. 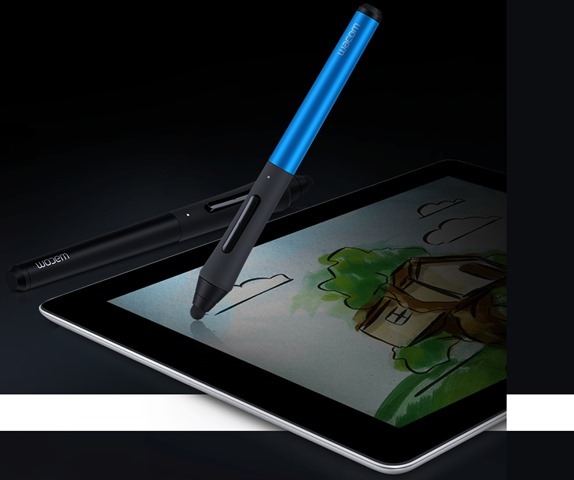 And now I need to mention a great looking new creative stylus for the iPad – just launched by Wacom today. It’s called the Intuos Creative Stylus, and it sounds like it should have great appeal for artists, creatives, and anyone who needs a powerful, precision stylus for the iPad. Oh, and it looks pretty damn stylish too. — A unique pressure-sensitive tip that recognizes 2048 levels of pressure. It’s said to offer the artistic control of real brushes, markers, and pens. — ‘Industry leading’ palm rejection technology. — Connects to the iPad 3rd gen, iPad 4th gen, and iPad mini via Bluetooth 4.0 Smart. This allows the pressure sensitivity, palm rejection, and also shortcut buttons when used with supported apps. — The supported apps list is already impressive and includes standout iPad art apps like SketchBook Pro, Procreate, Artrage, ArtStudio, and more. Adobe Ideas and others are listed as coming soon too. — A brushed aluminum body, soft touch grip and two colors to choose from – blue or black. It’s priced at $99.95. You can see lots more detail and place an order at the Intuos product page. It’s amazingly sensitive, with 0 grams of activation force. It works at all angles. It provides hundreds of levels of pressure. Best of all? No moving parts, making it incredibly reliable. — It’s said to have incredible battery life – up to months of continuous use using a standard AAA battery. The Cregle iPen is a new Kickstarter-funded stylus for the iPad – one that has some unique and powerful features about it. It has already far exceeded its Kickstarter funding target and should be available as a retail product early next year. 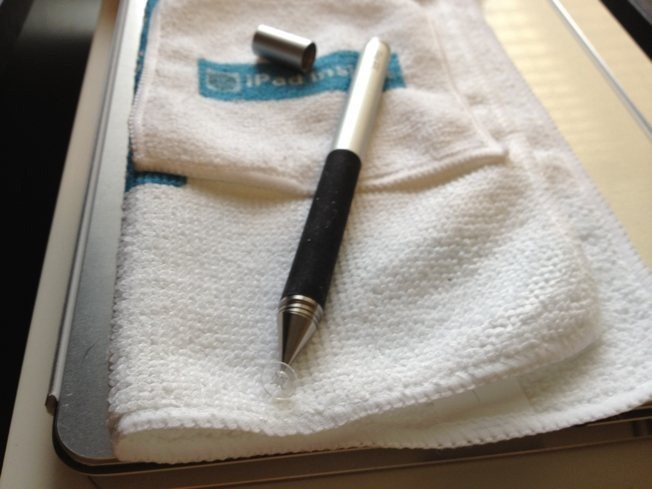 The Cregle iPen transforms the iPad into a content creation device, not just a content consumption device. iPen is the first active digitizer stylus that allows you to write with precision directly on the iPad. 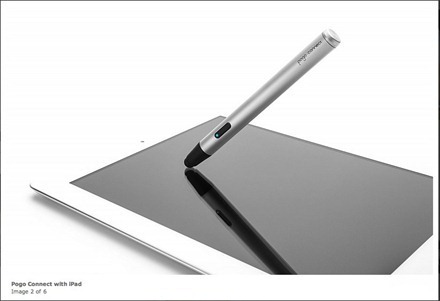 Unlike the passive digitizer used in the typical iPad stylus, iPen writes like a real pen with accurate positioning and palm rejection features that passive products simply cannot achieve. With the Cregle iPen’s active digitizer, the attached receiver picks up the iPen’s signal and its precise position as it hovers above the screen (whereas a passive stylus can be located only when the user touches the screen). This crucial advantage allows iPen to actively transmit 60 samples per second to pinpoint the pen’s exact location. The video demo above is very impressive – showing how the iPen can make really tiny strokes within cells on a graph paper style note screen. Another impressive thing about this project is it already has support from a number of iPad apps, which will allow for the use of the iPen in their apps – and Cregle are actively looking for more partnerships with app developers. This looks like it will be a very good option for iPad users who are looking to use handwriting recognition a lot, or who need a precise stylus for any reason. I swear I’m not spending my days seeking out iPad related projects on Kickstarter – but just lately I keep getting approaches from or coming across quite a few that are knocking my socks off. 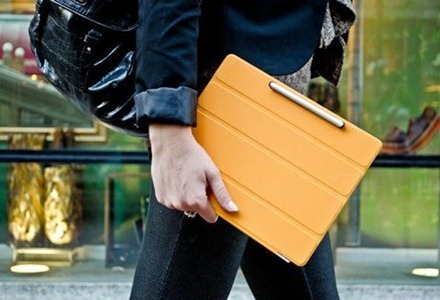 The Styló stylus attaches to the screen of the iPad 2 with two rare earth magnets, it’ll even work with the Smart Cover. No pen clip and a streamlined design that’s comfortable and practical. It’s always with your tablet. There at your convenience. We thought about how you interact with a tablet. It’s quick and intuitive and there’s no right or wrong way. 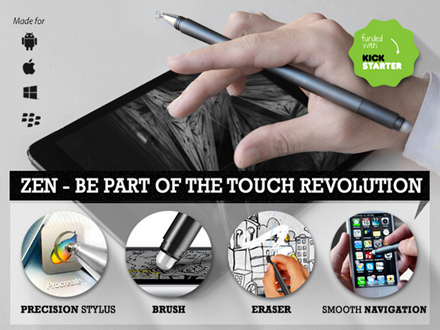 That’s why you can just pick up the Styló stylus and interact, it’s as natural as using your finger. Don’t think, just draw. I think those two features make this potentially one of the very best iPad styluses. I’ve backed it already on Kickstarter. If you back it for $20 or more you’ll land yourself one of these from the initial production run in either black or silver. I swear I didn’t wake up this morning thinking that today should be all about styluses – but the early portion of the day has turned out a little that way. I got two promo emails this morning, one right after the other in fact. Both about styluses. One a product that’s ready to ship soon, one a Kickstarter project looking for support. And both quite interesting in their own way. The first one is The Architect Stylus, shown above. This one is all about the powerful combination of style and function. Clean lines. Simple geometry. Minimalist approach. Sharp contrast. Comfortable. Practical. Smooth. Silent. All the goodness in one iconic design. Make the Architect stylus your companion today. There’s even a promo video for The Architect that takes this architect above even George Costanza levels – and seems to guarantee that all the hot ladies will want to be with me if I show this stylus off with the right jacket.